Finally, a solution to hard-to-peel or overcooked eggs. Making Instant Pot hard boiled eggs is a fool-proof way to get easy-to-peel perfectly cooked eggs. This 2 minute Instant Pot hard boiled egg recipe requires no ice bath and it’s the most hands-off way to get hard boiled eggs quickly and easily. How do you make perfectly cooked, easy-to-peel hard boiled eggs? You’d think it would be easy enough. After all, they’re just eggs, for Pete’s sake. But let me tell you, I have the hardest time cooking hard boiled eggs that peel easily. I always have pieces of egg coming off in bits and pieces when I peel them. I’ve tried all kinds of tips and tricks including adding baking soda or vinegar to the water, putting cold eggs in boiling water, using an ice bath after boiling…..
It’s exhausting, for something that should be simple, right?! 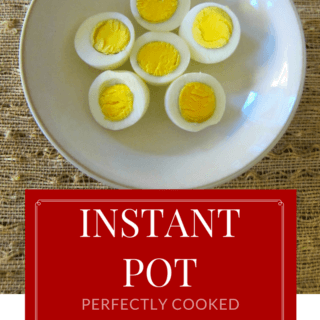 So I’m sharing with you how to make eggs in the Instant Pot pressure cooker – my secret to perfect eggs every time! Okay, I have to tell you I didn’t figure this out myself. I read this post on Cooking Eggs in the Instant Pot Pressure Cooker by This Old Gal. It’s easy and uncomplicated. I modified her method by releasing the pressure after 15 minutes. That’s it. But here’s the best part. The shell just comes off, like butter. There are many recipes showing you how to steam eggs in the Instant Pot and I’ve tried them: particularly the 555/5-5-5 method which cooks for 5 minutes, natural release for 5 minutes and ice bath for 5 minutes. But why go through all that when you can do it without any hands-on time? This 2 minute Instant Pot hard boiled eggs method has no formulas, no ice baths. So so easy! This method of cooking eggs is actually steaming the eggs because you’re putting the eggs on a rack. I have tried it without a rack and have had mixed results, so I would suggest using a steamer basket or rack for consistent results. I’ve modified the recipe to cook up to a dozen eggs and have had no problems. I’ve had readers cook up to two dozen eggs. Bring the eggs out of the fridge and let them warm up a bit before cooking them. Avoid eggs that have hairline cracks. I notice that white eggs have these more often. Try using low pressure, and do a full NPR (Natural Pressure Release). You may need to increase the cook time though to about 5 minutes. Try a different brand of eggs. 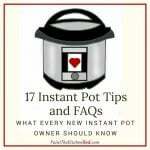 and aren’t familiar with how to use it, please read the Instant Pot DUO Beginner’s Quick Start Guide or the Instant Pot ULTRA Beginner’s Quick Start Guide first and then come back here to learn how to make 2 minute Instant Pot Hard Boiled Eggs. Add 2 cups of water to inner pot of Instant Pot. Place trivet or steamer basket in the Instant Pot. Carefully place eggs on trivet or steamer basket. Press ‘Manual’ (or ‘Pressure Cook’) and ‘+’ or ‘-‘ until the display reads ‘2’. The Instant Pot display will change to ‘On’. Once the Instant Pot is pressurized and the float valve is up, the display will count down from 2 to 0. The display will read ‘L000’ and start to count up in ‘Keep Warm’ mode. Your Instant Pot eggs should be perfectly cooked. Remove eggs from Instant Pot and place them in a bowl of water to cool, or allow to cool naturally. Once eggs are cool enough to handle, peel them. I refuse to show a photograph of me peeling the eggs because my hands look awful, especially in the winter (I need a hand model!) But trust me, these Instant Pot eggs peeled so easily! Instant Pot eggs are perfectly cooked and easy to peel. No more messing up hard boiled eggs either by over or under cooking or breaking apart while peeling! Add 2 cups water to main compartment of the inner pot and place trivet in the Instant Pot. Cook eggs on 'Manual' (or 'Pressure Cook') mode for 2 minutes. Yes, get one! It’s so convenient because it doesn’t require babysitting! And am I the only one who has a hard time peeling eggs?! Had no idea you could do this! I swear I cook hard boiled eggs the EXACT same way every time and it’s a total toss up as to whether they turn out the way I expect. 🙁 Thanks for sharing! You’re welcome! I know, I can never figure it out either. This is a fabulous idea! Hard boiled eggs can be hard to perfect, but this method looks foolproof! Great job! Those eggs look absolutely perfect. I don’t have an instant pot. Does this technique come over to a modern pressure cooker? I’ve always owned a stove top, old fashioned pressure cooker so this is the first ‘modern’ one I’ve had. I think that any electric pressure cooker would produce the same results, but the times might have to possibly change a bit? Peeling hard boiled eggs is really a big pain lol, so it’s always a good thing they can be easily peeled. And the eggs look beautiful in the pictures! The eggs turned out perfect! I have a hard time with peeling the eggs too sometimes. What a great method to make peeling so easy! Your detailed recipes are great! I don’t have an instant pot yet but definitely want one now! Pinning, thanks for sharing! Thanks Erica! I hope you get one…. I’ve heard so much about the Instant Pot. I’m gonna have to get one of these for myself! I grew up with a pressure cooker but it was scary and loud! This isn’t my mom’s pressure cooker plus it’s a slow cooker, and has so many features. Pretty cool! 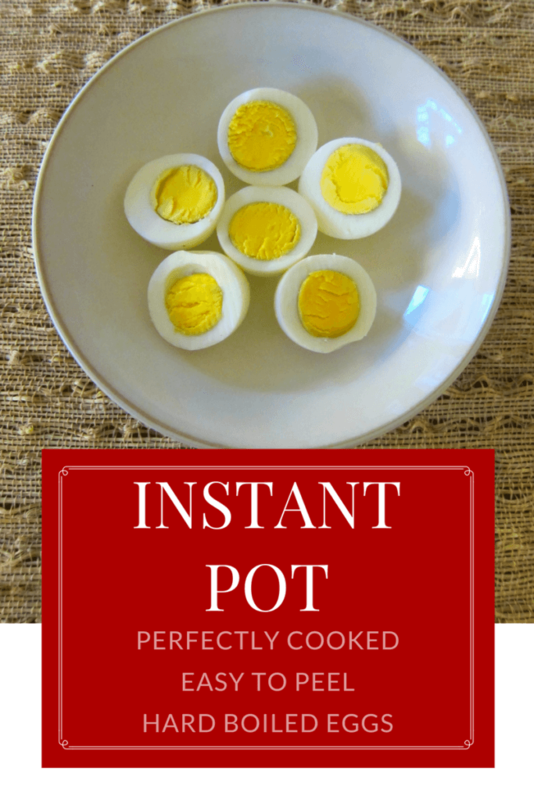 Now I want an instant pot!I have a heck of a time with peeling eggs, especially fresh ones. What a great tip, thank you for sharing! I feel your pain Riva! It’s especially frustrating if you want to make deviled eggs e.g.! This might be a dumb question, but can you tell me if I need to add more water if I want to cook 12 eggs at once using this method? No such thing as a dumb question! You don’t need more water with more eggs. You might want to get a steamer basket if you don’t already have one. Easier to fit more eggs. Enjoy! We eat a lot of eggs so I make a dozen at a time using this recipe. The timings work perfectly each time and the eggs are so easy to peel. Thanks! I know! I am always amazed at how easily I can peel eggs that I make in the Instant Pot. So glad I could be of help. hi, my ultra has an Eggs option – you didn’t mention that above? and can i do just one or two with this same recipe? thanks so much . first time user. Hi Sue! For instructional purposes, I tend to not use the preset buttons because different models have different buttons. The preset Eggs function on the Ultra defaults to 5 minutes. Some people like to do 5-5-5 for eggs (5 minutes pressure cook, 5 minutes natural release (NPR) and 5 minutes ice bath. I like my way better. What you can do to follow my recipe is to select the Egg function, change the time to 2 minutes, and press start. The Ultra is great in that it remembers the last setting you used and the next time you select Egg, it will be at 2 minutes and all you have to do is press Start. I hope that makes sense – good luck and enjoy your new Instant Pot! Oh, and yes you can do more or fewer eggs for the same times. Ok, I’m actually new to this whole cooking thing. I’ve never used a crock pot. My wife has put me in charge of cooking and bought me an instant pot for my birthday. So… I tried hard boiled eggs. Of the six three of them cracked. Weak eggs? Old eggs? New eggs? Too cold from the fridge? Hi Tom – how exciting that you’re trying something new. Re: cracking of the shells, this does happen. Did you have them in a steamer basket or on the rack? They may have thin shells, and hit up against the walls. Some eggs have tiny cracks to begin with too. You might also try to let them sit on the counter for a bit before pressure cooking. I’d give it another try. Hi there, do you have a suggestion as to how to change the display timer on the Ultra? Hi Candace – I’m not sure I understand your question. Do you mean the delay start time or the count-up timer after cooking is complete? The delay timer is one of the options you can set when you select the cook time. The count up time can’t be set, unfortunately. You just have to watch it and release pressure when it counts up to whatever you need. I hope that makes sense – so hard to describe these things in words! Just got the Instant Pot yesterday and this was the first thing I made after the test. I was curious to see if this would work well with fresh eggs as they are much harder to peel than older eggs. So happy to report that the eggs were a breeze to peel and these eggs were laid by our hens in the past few days. Perfectly cooked and delicious. So glad i found your website. 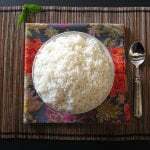 I look forward to making one of the Thai recipes soon. I know exactly how you feel, John! One of my favorite things about the IP is the easy-peel eggs! Thank you for visiting the website, and also for taking the time to comment. I have tried hard boiled eggs in my IP several ways with varying results. This morning I tried your method and they came out just perfect. Thank you so much. I get brown pastured eggs that are usually large to extra large, so to be on the safe side, I increased the time to 3 minutes. No green ring, the whites were not tough and the egg peeled easily after rinsing in cold water for a minute or so. I will try the 2 minute method next time and note the difference, if any. Excellent, Pam! I love this method and I’m glad you didn’t have any trouble. Do let me know what happens with 2 minutes. I am disappointed. The insides of my eggs turned out perfectly, but when I peeled the eggs I had some pieces of the white coming off in small chunks. I followed the recipe using my Instant Pot Duo Plus. The only thing that I was unsure about was what to do when the 2 minutes of cooking time was up. I wasn’t sure if the Keep Warm was working, so I pressed the Keep Warm button and then waited until it counted up to 15. Does the Keep Warm cycle come on by itself when the cooking is done? I want to try this recipe again because it does seem like a very easy way to make hard-cooked eggs. Any suggestions? Ohh, I’m so sorry to hear that! This is truly one of my favorite things to make in the Instant Pot and I’m not kidding when I say I’ve always had bad luck with peeling. I’ve never had a bad experience making eggs in the IP. It should automatically be in Keep Warm, so that should not have been an issue. Here are some variables that could cause your issues: temperature – leave them out for a bit; size – get large rather than jumbo; store bought vs farm. You can also try to stick them in an ice bath for a couple of minutes after taking them out. If none of that works, try cooking using the 5-5-5 method: 5 min at high pressure, 5 minute natural release, and 5 minutes in an ice bath. I sure hope you have better luck next time. Thanks for commenting, Barb! I cooked exactly as instructed and after cooking put the eggs in a bowl of ice water. The egg yolks had a grey/green ring around them. I understand this to mean the eggs have been overcooked. Any suggestions? Hi Rob, it sounds like they overcooked a tad. Try to do shorter natural release next time, maybe? It could be the size of the eggs…. I just got the Lux Mini. I’ve been scared of pressure cookers all my life because in my childhood 2 family friends were badly hurt when they exploded. Today, I live in expensive California, which means I wound up temporarily living in a tiny cottage with a mini fridge, no freezer, and no stove. I got mad at buying already boiled eggs at the grocery store and out my IP came, despite my fears. Thank you for this recipe!! I now have the courage to be a little more adventurous next time! Catherine, I had a similar experience with my mom’s stovetop pc when I was a child, so I understand your feelings. But you can rest assured that the IP is perfectly safe. 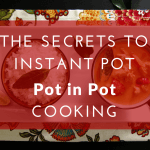 The Instant Pot will be a godsend for your situation. I hope you get to try out some of my other recipes. All the best! My wife and I are fans of your site, Neena, and we could both offer many points of appreciation or praise for this recipe and much else… but there is one claim on paintthekitchenred.com that needs correction: Your hands are fabulous, not terrible. My wife says to tell you she admires your long, expressive fingers, and your taste in rings, and so was surprised to hear that you’re not pleased with them. We both think you should definitely feel confident being your own hand model. 🙂 Anyway, thanks again for the recipes, for the best substitute owner’s manual, and overall for giving us a great start with our Instant Pot Ultra. Awww – that’s such a sweet comment! You are too kind. I am very self conscious of my hands LOL! So thank you for taking the time to give me such great encouragement. Y’all are the reason I do this blog and share all these recipes. Thank you for your support!